In case you haven’t noticed, dark hardwood floors are currently the most popular color, and they just keep growing in popularity. Dark woods add drama and they tend to go well with just about anything from white cabinets, to dark furniture. This is because dark hardwoods are cool toned, so they go with BOTH cool and warm paint colors. 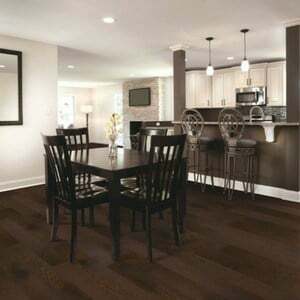 They are so much easier to decorate with compared to mid or lighter floors, and especially easier vs hardwood floors that have reds (or even red undertones). So, if you’re looking for a color that is both stylish now and will work with future design trends, dark floors are the way to go. And, I want you to remember that if you have solid hardwood flooring, you can always and and refinish them in 10 to 15 years (if you choose). Below, I’ve gathered some of my favorite dark hardwood floors. You can buy all of these online…just click on the pictures to find out more info on widths, species and prices. And, if you already have hardwood floors and want to refinish them, check out this article on the latest stain color trends. In the article you can see pictures and the stain shades we use most often. And, at the bottom of this article, I have a few tips for selecting hardwood floors. I also included some recommended cleaning products for hardwood. Please note that this article contains affiliate links. That means that if you buy them, I may earn a small commission. You can read my full disclosure at the bottom of the page. 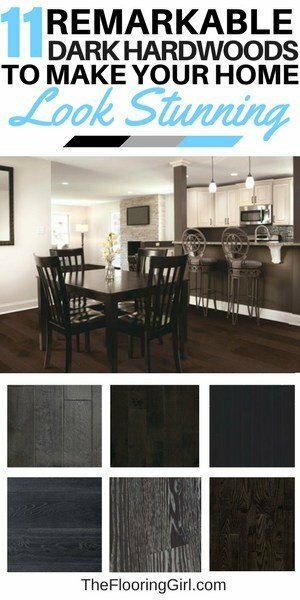 Below are some of top picks if you’re looking for pre-finished dark hardwood flooring. Some of these are dark ebony, others are dark brown. And, there are a few with a wirebrushed effect so that they are a combo of black and white for a grayish effect. 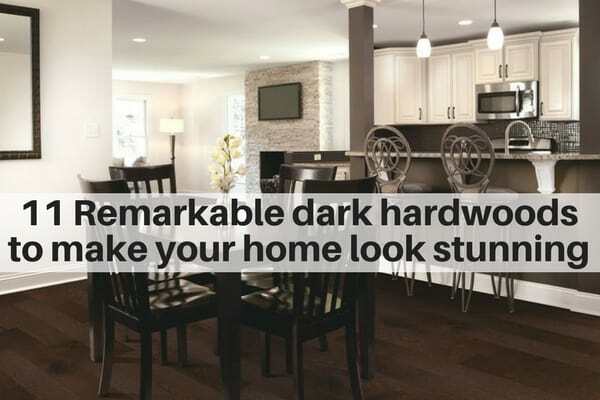 Here are the key things to consider when selecting dark hardwood floors.. Oh, and in case you have questions about dark vs light hardwood flooring, check out this article. Also, you can click on most of these pictures to get more info about them. Wider planks make your room look larger (that’s just how our eyes work). When it comes to solid hardwood, the smallest width is 2 1/4.” Nowadays, most people do at least 3 1/4″ and it is amazing how much nicer these planks look. Usually the cost difference between these two sizes is inconsequential, and it is a no brainer which looks better. 5″ widths are even more popular, and most people prefer these even more. They look quite elegant and modern, but if you have small rooms, these may be a bit over powering. But, for mid and larger spaces, these look wonderful. 5 inch planks can cost more for the wood (in some cases, it’s a minor difference, in other cases, it’s more substantial, especially if it’s solid wood and select grade). And, bear in mind that if it’s solid hardwood you will need to nail and glue the planks, so you will pay a bit more for labor and adhesive. Some brands offer 4″ widths which is a nice compromise. In general, I’m a big supporter of doing solid hardwood when you can as this gives you the ability to sand and refinish many times. But, engineered wood often works best for warmer and more humid environments and in homes or apartments built on a concrete slab. And, there are now many engineered products that can be sanded. You can read more about this here: solid vs engineered hardwood). Most people prefer satin (low sheen) and even matte (no sheen) finishes now, It just looks better and more stylish. And, importantly, the glossier you go, the more dated the wood appears and the more difficult it is to maintain (i.e. shows dirt, scratches and dents more). Satin and matte finishes look better longer, and you won’t have to worry about each speck of dust. The most common species here in the US is red oak. Because of that, it tends to be less expensive, and you are most likely to find red oak on stair treads and banisters. Red oak has strong graining, which some people love and some people hate. One great thing about the graining is that it helps camouflage scratches and dirt a bit better (a great choice if you have a dog). If you don’t like the look of the graining, you’ll be happier to know that the darker you go, the less you see the graining. Mid toned woods show the grains the most and very dark and very light show the grains the least. An alternative is to get white oak. White oak is similar to red oak, but a bit less grainy and a bit darker (and doesn’t have the pink undertones that red oak has). 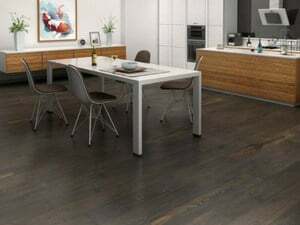 Also, white oak is a bit more resilient to water and a tad harder, so it’s a great option if you adding hardwood to kitchens and/or entryways. You will also find some maples and birches in dark hardwood. These tend to be more expensive (as these woods are less abundant). They have the least graining. But, the stains come out a bit blotchy, so make sure you look at this before you buy…some love this, some hate it. And, there is hickory which is more rustic and has more color variation within the boards and across boards. It’s much harder than oaks or maples and tends to hide things more due to all the variation. This is a great choice if you have dogs and love the rustic look. Hickory often costs more, too. How do you take care of dark hardwood floors? The maintenance for dark hardwood floors is pretty much the same as for any hardwood flooring. It’s just the dark hardwood floors. It’s just that dark hardwood floors show dust and scratches more, so you need to be a bit more careful. Yes, shoes can do a number on your floors, primarily due to the dirt and small pebbles that get caught in them. So take them off at the door. The oils on bare feet can leave marks and it’s just more noticeable on dark hardwoods. Also, socks will keep your feet cleaner and can keep you warmer. Slippers are fine, too. Always use a regular hardwood cleaner (do not use a product that promises to add sheen or restore the luster to your floors…those products will actually wear down your floors sooner). I personally recommend Bona hardwood cleaner (since it’s the best) and Bona’s Microfiber mop. You can get the combo here on Amazon. If you are about to sand and refinish your hardwood floors, be sure to get 3 coats of polyurethane. That 3rd coat can add a good 2-3 of life in your floors. Check out this article on the best brands of polyurethane. Most people don’t realize that you need a DIFFERENT vacuum cleaner for hardwood floors than for carpets. They are designed differently and many vacuums for carpet can actually scratch hardwoods. This is the one I recommend to my customers. Check out this article for more info on vacuums for hardwood floors. Because dark hardwood floors show dirt more, I’d recommend cleaning (with a microfiber mop) at least once every other day. Vacuuming is probably only needed once per week, especially if you mop the dust every 1 to 2 days. This is a little known secret that most flooring stores won’t tell you about. This is a preventative maintenance tip. If you screen and recoat your floors every 3 to 4 years (before they get scratches), you may be able to avoid sanding and refinishing all together. This is a simple 1 day process. For more cleaning and maintenance tips, check out this article on how to prevent scratches in hardwood floors. Do dark hardwood floors make a room look smaller? People often avoid dark hardwood flooring as they are afraid it may make their space look smaller. That’s because dark colors absorb the light, while lighter colors reflect more of it. But, there is much more than contributes to how large a room looks and the floors are just one element. Remember, if you think of a room as a cube, the floors are only 1 side (or 1/6″) of the space. You want contrast in a room, and it works very well when you have dark hardwoods and then choose a light color for the walls (which represent 4 sides of that cube. Plus of course you have the ceiling that would typically be white. Think about your floors as the palette and base for your room. Then, consider that you can place a lighter area rug on the floors, as well as furniture. So a good portion of the floor is blocked by the lighter elements. 1. Go light on the walls (and white on ceiling). The walls take up more space than the floors anyway. And, choosing a paint colors with dark hardwood floors is easier, anyway…almost everything goes. Area rugs define the space and add character and decor. They also add some warmth and comfort for you (and your pets). More natural light makes the area feel more spacious. Make sure you window treatments don’t block the light (as well as bushes that may be outside). And, make sure your windows are clean (it’s amazing how much more light shines in. And, of course, make sure your lighting is strong for the evening. Open floor plans make spaces look larger (and of course they are slightly larger as there are fewer walls). It allows light to flow across rooms. If a full open floor plan doesn’t work for your budget or layout, consider doing half walls, widening door ways, etc. Light colored or even white/off white furniture will also make your space look larger. Or choose a light gray sofa rather than black. For kitchens, white cabinets work well, and they are the most popular anyway. Do dark hardwood floors show scratches more? Yes, they often do. Scratches show more on dark stained floors as the wood underneath is usually lighter. And, dust shows more as there’s more of a contrast. 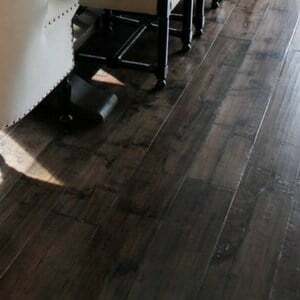 Can you make dark hardwood floors lighter? The answer is usually yes, provided that you a solid hardwood floor and have a lighter hardwood such as oak or maple. 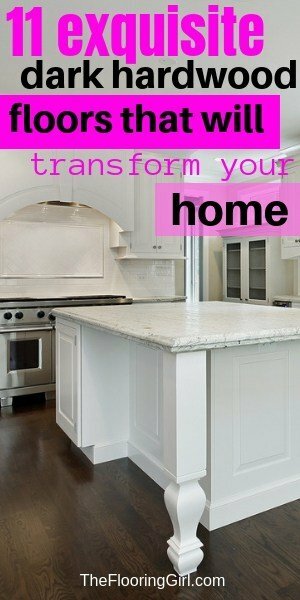 If you have solid hardwood, you can sand and refinish it many times. When you sand the floors, the stain color is removed, and you have raw hardwood. From there, you can choose a different stain (it could be darker or lighter or you could even go natural (i.e. no stain). Most hardwood floors in the US are light, with the majority being oak. Oak is a light wood so it can go lighter. Likewise, maple is light, so is ash, hickory and pine. They all vary a little, but for the most part they are light/lightish and even if you have a dark stain on them, they can go light if you prefer. If you have a naturally dark hardwood (e.g. Brazilian walnut, American Walnut, Brazilian Teak), there is only so light you can go as the woods are naturally dark. Or, if you have a reddish species (e.g. Brazilian cherry, American Cherry, Mahogany, Tigerwood), these are naturally reddish and darker, so when you refinish them, they will still have red in them and will be a bit darker. Thankfully, these species aren’t used too often, so if your goal is to go lighter, chances are you can. Dark hardwood floors are beautiful and they really give an upscale look to your home. There’s a reason they are the most popular these days. They are stunning and easy to decorate with. Choose the one you love best. 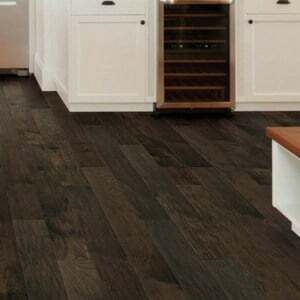 What are your thoughts on dark hardwoods? Leave me your thoughts and questions below in the comments.